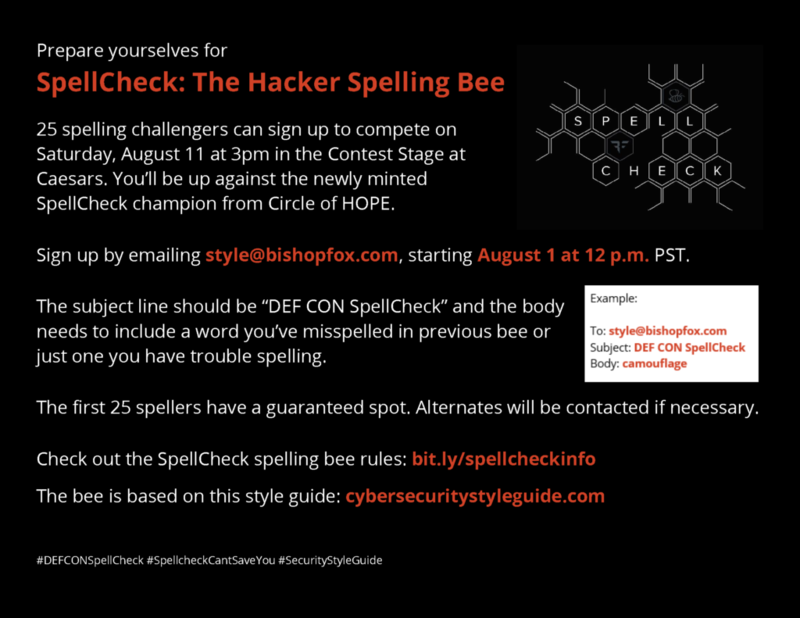 The official spelling of each term for this bee comes directly from the most recent version of the Bishop Fox Cybersecurity Style Guide (bit.ly/securitywords). The terms in the bee may have variant spellings or homophones in the wide world, but if it’s not the one from the guide, it is considered incorrect for this bee. Spellers should repeat the term back to the announcer before spelling so the announcer can make sure the speller heard it correctly. The announcer will then help clarify the pronunciation if something was misheard. Spellers can ask to hear the term repeated. They can also ask for the part of speech, additional information about the term, or an example sentence. Spellers can ask for this information as many times as they’d like. If there are pronunciation variants, the announcer will mention that and say the variants up top. If spellers do not ask clarifying questions and there is a homophone for that term (Example: Black Hat vs. black hat) and they spell the wrong one, that is considered incorrect for this bee. Spellers will have a few minutes to begin spelling their term. The timer will start when they hear the term for the first time. If a speller has not begun spelling when the timer ends, they are out. Spellers cannot change their answers once they begin. They can restart if it helps to regain momentum, but they can’t change the letters and capitalization that they’ve already said out loud (like Scripps rules). If it helps, spellers may mime writing their term in the air, trace it on their shirt with a finger, trace it on their arm, type it in the air, or text it in the air. The first three rounds will all be completely lowercase terms. All terms in Round 4 will contain at least one capital letter. After Round 4, capitalized terms will be mixed in at random for the remainder of the bee. If spellers are incorrect, the announcer will ding a little bell and the audience will go “awwwwwwww.” If at least one speller has already spelled successfully in that round, the incorrect speller should then go join the crowd. The winner will correctly spell one more term than everyone else. (Example: Six spellers remain in a round. If only one speller is successful, they win.) If two spellers are left at the beginning of a round, and only one successfully spells in that round, the successful speller is the winner. (Not like Scripps rules) If two or more spellers survive a round, the bee will continue for another round. If ALL remaining spellers are eliminated in a single round, they will all return for the next round. If the last few spellers are amazingly difficult to eliminate, the announcer may introduce variant rules to the bee. All spellers will get to keep their speller IDs as participation trophies. The winner gets a unique prize in addition to that. Sign up in person at the Info Desk, starting at 10am on Friday. Sign up in advance via email starting August 1st through style@bishopfox.com. This is a way to pass the time in traffic or walking through parking lots. The license plate game is played by choosing 3 random letters (conveniently generated by most US license plates), and then naming as many words and phrases that can be made out of those letters in that order, consecutively or nonconsecutively. It may help to think of the letters with a space before and after each of them ( _B_R_T_) to visualize your options. Break them up into separate words or squish them together, do what you like as long as they stay in that order. If you get stuck, you can ‘cheat’ by using wildcards on OneLook.com (e.g., *b*r*t*). Warning: those results are often very NSFW. When you play, you’ll likely personalize the length and goal of the game. Shortest word, longest word, name of a person or place, idiom, best invented compound, your victory conditions are your own. If you come up with some particularly good ones, leave a comment or tweet them using #_B_R_T_ in the next week, and they’ll be added to the master list here. No points, no prizes, just a warm-up exercise for your brain before games of Scrabble, crossword puzzles, anagrams, and any other word-based fun you plan on having today. Follow @E_Briannica for future prompts. The license plate game is played by choosing 3 random letters (conveniently generated by most US license plates), and then naming as many words and phrases that can be made out of those letters in that order, consecutively or nonconsecutively. This is a way to pass the time in traffic or walking through parking lots. It may help to think of the letters with a space before and after each of them ( _V_G_N_) to visualize your options. Break them up into separate words or squish them together, do what you like as long as they stay in that order. If you get stuck, you can ‘cheat’ by using wildcards on OneLook.com (e.g., *v*g*n*). Warning: those results are often very NSFW. When you play, you’ll likely personalize the length and goal of the game. Shortest word, longest word, name of a person or place, idiom, best invented compound, your victory conditions are your own. If you come up with some particularly good ones, leave a comment or tweet them using #_V_G_N_ in the next week, and they’ll be added to the master list here. No points, no prizes, just a warm-up exercise for your brain before games of Scrabble, crossword puzzles, anagrams, and any other word-based fun you plan on having today. There will be a new License Plate Game next week on Wednesday. Follow @E_Briannica for future prompts.